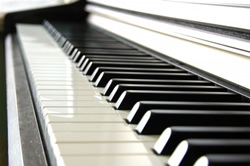 I am a well-qualified and experienced music teacher based in Darlington who offers expert tuition in piano, flute, music theory and composition. I teach people of all ages and at all levels – from beginners to advanced. Those of my pupils who sit exams in piano pass with high marks and are frequently invited to play in the High Scorers’ Concerts. None of my pupils has ever failed a theory exam, nearly all passing Grade 5 theory with distinction. Lessons are conducted in a friendly and informal manner but comprise a wide and thorough musical education. I strive to make learning music as interesting and stimulating as possible. My teaching style is adapted to each pupil’s ability and personality and I hope all my pupils enjoy their lessons. In my role as music tutor I encourage my pupils to choose music to play that they like, or if students are taking composition lessons with me, I encourage them to write music in styles that they like. Theory lessons are focussed around whatever syllabus the student is following. I give piano and flute lessons and instruction in theory and composition at my home (in the west end of Darlington) but I also offer theory and composition tuition by correspondence.